Book a cheap ferry to Austria online. Find the best deals by comparing ferry companies. Austria may be landlocked, but believe it or not you can still book ferries there with AFerry. Book ferries to Austria from Hungary with Mahart Passnave, sailing along the river Danube. Mahart Passnave operates a fleet of high speed hydrofoil vessels sailing from Budapest to Vienna. Booking a ferry to or from Austria couldn't be easier with AFerry. You can either use the booking form at the top of the page. Or, if you see a price you like on the page, just select the number of passengers and click Get Price. Austria is known as the capital of The Alps. The mountain range is absolutely stunning and provides the perfect setting for winter sports. Whether you are complete beginners, or seasoned professionals Austria is a fantastic place to ski, snowboard and skate. The other main attraction in Austria is Vienna. Once the capital of a strong Habsburg Empire, the fading imperial glories are still there to be seen. Explore the architecture which still stands today, and learn of Austria's rich history in the Imperial Treasury. With AFerry you can book ferries directly to Vienna from Budapest in Hungary. Mahart Passnave provides services sailing on the river Danube. 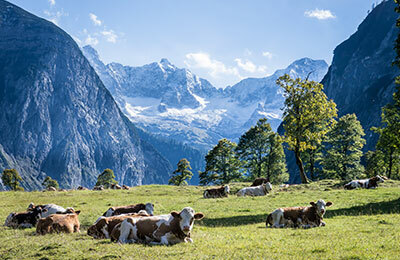 Austria's stunning Alpine scenery, iconic architecture and the Sound of Music bring people from all over the world to central Europe. But there's more to it than that, as the contemporary cities play host to diverse museums and sophisticated bars and cafés. The Sound of Music has made Austria, and particularly Salzburg, famous around the English speaking world. While most local Austrians will have no idea what you are talking about if you mention the musical, you will feel it wherever you go. You can take special tours to reach filming locations, and theatres still perform the story. Vienna is Austria's capital city, and the former capital of the Habsburg Empire. Fading reminders of this once glorious empire live on in Vienna today, with the Imperial Treasury being the best place to learn about Austria's rich history. Austrian cuisine is hearty and filling, epitomised by the Wiener Schnitzel, Austria's national dish. But it's really the bakeries where Austrian cuisine comes to life. Almost every village in Austria has its own bakery, serving a wide variety of freshly baked goods, both sweet and savoury. Rail services are the most popular form of public transport in Austria. Trains are comfortable and reasonably priced, connecting the major cities and many towns. Travelling by car is a good idea if you want to explore more rural areas, or popular spots in the mountains as these are not well served by public transport. Driving in Austria is a pleasant experience as the country is small, the roads are in good condition and the scenery is stunning. The Old Town in Vienna is littered with breathtaking architecture, including many old churches and palaces from the Habsburg era. You'll also find plenty of cafés and restaurants where you can relax with traditional Austrian cuisine and watch the world go by. If you take a car, it's well worth driving up the Grossglockner High Alpine Road, taking you through the alps and nearly 2800 metres above sea level. You'll be spoilt with panoramic views of the Alps and you'll even find snow and ice in the height of summer! There are tolls to use the road but it's completely worth it. Salzburg's Old Town is an amazing place to walk around, you can easily lose yourself down small alleys and side streets following the unique architecture. It's worth walking up to Hohensalzburg Castle, a magnificent spectacle in itself but once you are there the views you get of Salzburg below are incredible.